Gilbane served as Program Manager for Downtown Houston’s most impressive hotel to date, the Hilton Americas-Houston. With 1,200 guest rooms, the city’s largest ballroom, luxurious spa facilities, trend-setting restaurants, and state-of-the-art technology, this new hotel is a premier convention destination. Amongst numerous other amenities, the high-tech hotel boasts nearly 92,000 square feet of flexible meeting space, the largest ballroom in the city at 40,000 square feet, an additional 26,000-square-foot junior ballroom, 30 meeting rooms, express elevators, wireless capabilities and high-speed Internet access in every room. Modern, high-tech features are abundant throughout this project, especially in the meeting space. 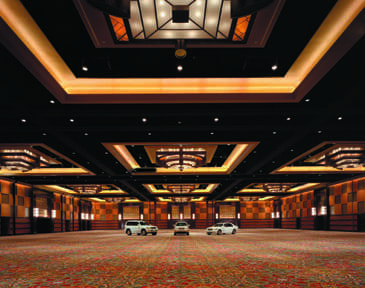 Each ballroom contains “Smart Walls” with built-in presentation screens in each section, professional show power lighting and audio connections controlled by LCD panels. In addition, all meeting rooms have in-room Ethernet connections and motorized presentation screens. The hotel is conveniently connected to the George R. Brown Convention Center by a double-decker pedestrian skybridge. The convention center and hotel will also share a 1,600-car garage which will be linked to each building via separate skybridges. Gilbane built the George R. Brown Convention Center in 1987 and its expansion in 2003.